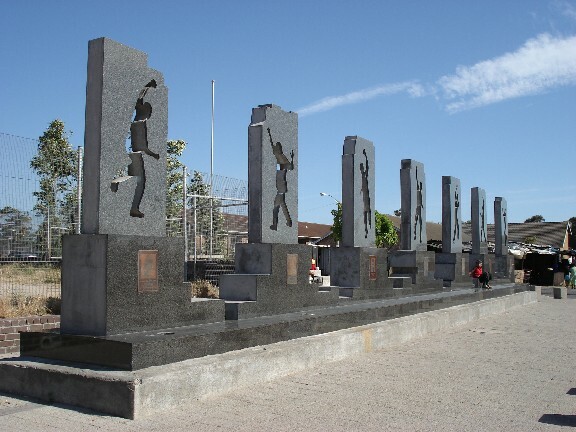 This monument recalls the brutal murder of seven young black activists by South African security forces in 1986. The young men were on their way to what they believed to be a job interview in a minivan driven by an undercover security officer, when they stopped at a roadblock and the police opened fire. Security forces covered up the crime, claiming it was an act of terrorism, but the real story was exposed during the Truth and Reconciliation process and a memorial now stands at the site where they were killed. The monument was erected on On 21 March 2005 – South Africa’s Human Rights Day — and depicts Mandla Simon Mxinwa, Zanisile Zenith Mjobo, Zola Alfred Swelani, Godfrey Jabulani Miya, Christopher Piet, Themba Mlifi and Zabonke John Konile.